We all get a little lost on our way through life. Sometimes we overlook those hints and tips that could lead us to happiness a little faster than the long way around. By reading Treasure Hunt – Follow Your Inner Clues to Find True Success by Rizwan Virk you will gain a better sense of appreciation for those little signs in your life that you might be ignoring. Using first-person experience this book will help all readers identify what they want most out of their lives. There are snippets of anecdotal evidence as well as some ethereal sources of inspiration that will help lead you on your journey of self-awareness. This book covers the age-old-question of how to bring meaning to your life with comprehensive chapters and exercises designed to open your awareness to the little things that are constantly happening around you. Styled as a comfortable self-help type book it is divided into five parts to help readers take their journey one step at a time. Trying to give meaning to your life and identify how to reach the success that you long for cannot be done overnight. It takes time and patience and an ability to see that which cannot be easily seen. Virk understands that and makes careful effort to properly guide readers on this potentially tricky path. Of course, there’s nothing that says you have to read this book from beginning to end. As with most self-discovery books you can jump around the chapters if you wish, but you will get much more out of it if you follow the traditional reading path. It is obvious that the content of this book was carefully thought out. The order in which things are done is also very linear and easy to follow. There is no unnecessary fluff or padding to make this book longer than required. The case studies that readers will find peppered throughout the book help lends credibility to the content. The exercises that are available within the chapters’ helps readers practice what they’ve learned so far, making the information remain in their minds for longer. This is especially beneficial if you are trying to learn a new skill or start a new routine. The styling of the book is very pleasing and the way the chapters are laid out and broken up makes it easy to read and digest. This can be the downfall for many self-help books with their epic chapter lengths. That approach can lose readers as opposed to bring them in. Virk does not have that issue, which makes this that much better to read. If you’re looking to get some clarity in your life and maybe get a little assistance in recognizing those little signs, then you need to read this book. 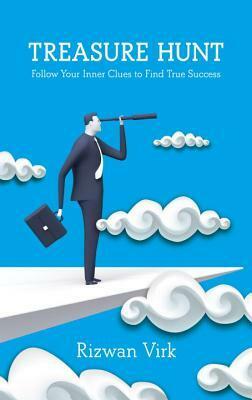 Treasure Hunt – Follow Your Inner Clues to Find True Success by Rizwan Virk is a modern approach to finding out what signs we might be missing and how to make ourselves more open to receiving and identifying those messages the universe is trying to tell us. Easy to read with clever case studies and personal anecdotes, this is not a self-help book what would have you running for the hills. The information is carefully thought out and planned in such a way that readers won’t have a difficult time understanding and implementing the skills. Enjoy your journey and the ensuing hunt!